Today's moms are busy. Whether they're running to work or to soccer practice, they need to stay connected — and what better way than with a smartphone? 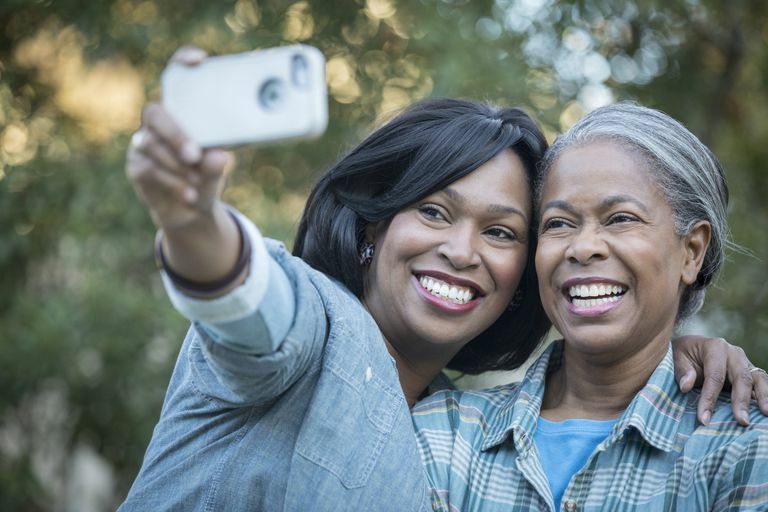 Your mom will love her new phone for many reasons, but best of all, she'll always be reachable and will be able to combine her iPod, camera, and phone into one amazing device. Most smartphones have all the modern features like Bluetooth, Wi-Fi, app stores, cameras, and plenty of storage to hold pictures, videos, and sometimes even documents and other files. May be large for some hands. Let's be honest: The iPhone is the smartphone that tops most wish lists—even your mom's. It features a sleek design with a big, beautiful touch screen and all the apps you could ever ask for. If your mom doesn't have a digital camera or hates lugging it around with her, she'll love the fact that the iPhone takes beautiful pictures and has plenty of storage to keep a hold of all of them. The iPhone X can charge wirelessly, which is one huge benefit for parents and other busy folks. Just toss it on the charging pad and forget about it until its needed. If the newest iPhone is too pricey for your budget-minded mom, consider an older iPhone like the iPhone 7 or iPhone 6, which are permanently discounted because there are newer ones available. Can’t add SD card for additional storage. If your mom is a lover of all things Google, she'll surely appreciate the Pixel smartphone. It works so well with other Google products like their speakers, the Daydream View VR headset, and Google Assistant. If mom is a power user, it's another reason to start using this phone. Use it all day for gaming and emailing and then charge up quickly wherever you are—the phone can churn out seven hours of battery life with just a 15-minute charge. Not only is the Google's Pixel 2 smartphone a quick charger, but it's also water-resistant and super fast. Perfect for gaming and other intense things like multitasking and streaming. Lots of modern smartphones can take amazing photos, but Google's smartphone often makes many "best camera-taking phone" lists due to its Portrait mode option and 4K video support. If your mom loves to use a camera, we recommend the Google Pixel phone. On top of that, Pixel users get unlimited online storage for their photos. This means every image taken by the Pixel can be uploaded to Google Photos for free, in their original quality. The phone can store up to 128 GB of data anyway, but free online storage is great, too! The XL version of the Pixel provides a whopping 6" of its spectacular OLED screen. This is a whole inch larger than the standard version and makes it even easier to watch movies, browse the web, and take videos and photos. Camera not as good as other choices. Few phones these days have a physical keyboard, but that's exactly what you get with this Android-powered smartphone from BlackBerry. Beyond the gorgeous screen and other standard smartphone features like GPS and Wi-Fi, the KEYone isn't much different than other phones. However, if your mom is a fan of physical keyboards and can't imagine how she could use a touch screen, go with the BlackBerry KEYone. It makes typing even long messages a breeze. Other things to consider about the BlackBerry KEYone is that it comes with a Corning Gorilla Glass screen and provides excellent battery life even though it has super-charging — it can charge to 50% in less than 45 minutes. In short, if your mom likes to have a physical keyboard on her phone and needs a way to charge her phone fast before leaving the house, go with the BlackBerry KEYone. Live Focus feature adjusts background blur in photos. Large screen makes everything easy to see. S Pen offers lots of intriguing capabilities. Fingerprint sensor is in an awkward position. The other phones mentioned above are on par with the Samsung Note8. All of them are equally as attractive with an edge-to-edge display and are comfortable in the hand. One small difference that sets this phone apart from the others is its 6.3" AMOLED screen. The Note8 pushes the boundaries into phablet territory, so if your mom is already a fan of tablets but wants one small enough to take with her, give the Note8 a try. The Note8 is perfect for anyone used to a physical keyboard or a large touch screen but is hesitant to switch over to an all-touch display. The screen is big enough to comfortably type with the on-screen keyboard. Because this phone is so large, Samsung offers the S Pen stylus for finer control over the touch screen. This is perfect for not only drawing and writing on the phone but also playing games, selecting small areas of a spreadsheet, etc. Outdated and hard to find. If the BlackBerry KEyone is a bit too corporate for the mom in your life, and these other smartphones too "breakable," consider the BlackBerry Pearl, a more compact (but also older) version of BlackBerry's popular smartphones. It takes the familiar QWERTY keyboard layout that you see on most smartphones, and makes it smaller by putting two letters on most of the keys. This allows for a smaller, sleeker phone — although it can also mean slower typing. The Pearl is available in slightly different versions from all of the major cell phone carriers.